Cunard’s Queen Victoria has a new Verandah – not a cabin balcony this time but a restaurant to match the one that has proved to be such a success on sister ship Queen Elizabeth. It replaces the Todd English speciality restaurant on Deck 2, just off the Grand Lobby. How long now before Victoria’s Chart Room bar is replaced with a Britannia Club restaurant like the one which has been a hit on Elizabeth? Todd English is an American celebrity chef – he opened his first Olives restaurant in Boston in 1989 and it was followed by one in Bellagios, Las Vegas and another in New York’s Union Square. He has another eponymous restaurant on board Queen Mary 2; Cunard does not appear to have any plans to replace this in the near future. Victoria’s 100-seat Verandah opened to passengers for the first time on the ship’s 15-night cruise to the Baltic which ended at the weekend. The menu has been created by Michelin-starred Jean Marie Zimmermann who is Cunard’s global culinary ambassador. One highlight is carpaccio of smoked beef with marinated aubergine, quail’s egg and truffle mayonnaise, which is served under a glass cloche filled with scented smoke. 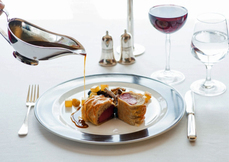 There is a choice of 11 main courses including beef and lobster flambéed with Cognac and truffle with Parmesan fries – the most popular dish to date – and baked rack of lamb in pastry with morels and Madeira (above).